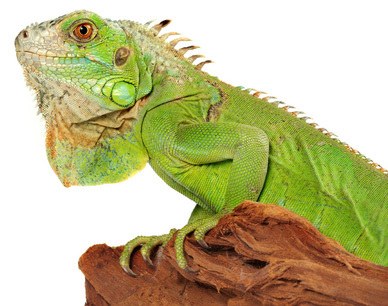 A green iguana can be a great pet, but you must give him a proper home. He will need a habitat that allows him to move around, eat, sleep, bask, and explore. Giving your pet an ideal home will help him have a long, healthy, and happy life. Since your iguana can grow to be quite large, your pet’s cage will need to be big. An ideal iguana cage is often bigger than most people expect. For an adult iguana, his cage should be at least 8 feet long, 3 feet wide, and 6 feet high. Even though this is a big cage, bigger is even better, so go with the biggest cage possible. Cages this large aren’t usually commercially available and you may have to build your pet’s home. A habitat can be relatively easily built with 2 x 4s, wire mesh, and plywood. You could make all the sides of the cage from wire, or use plywood as walls for three of the sides and a wire mesh door for the front. Solid plywood walls may be better for colder climates since the walls will make it easier to maintain a proper temperature in your pet’s home. Alternatively, you could use a small room or a large closet as a cage. You would need to replace the room or closet door with a screened door and make sure there is enough ventilation. Your iguana’s cage should not be located near windows, drafts, heaters, air conditioners, or anything that can raise or lower the habitat’s temperature to extreme levels. You pet’s cage should also be placed where he can watch and interact. Iguanas love to watch and study their surroundings. Keeping your pet where he can see what’s going on in the world around him will make him happy. Your iguana will like to sit up high, so you want the decor to fulfill his needs. The cage should have various shelves or ledges at different heights for resting and basking. It should also have large sturdy branches for climbing and access to the ledges. Ramps and other ways to climb and explore can also be included. You should also provide a place where your pet will feel safe and secure. A hide area, like a wooden box, is an easy way to give your iguana a place of security. Iguanas need UVB light for at least 12 hours per day to remain healthy. Sunlight is the best source of UVB, but that is not always available to a pet iguana. Sunlight through a window is not a source of UVB since the glass filters out the UV light. UVB fluorescent bulbs are available and a good source of UVB. You should make sure your pet can get close enough to the UVB light to receive its full effect. Iguanas also need heat to remain healthy. Around 85 degrees F seems to be the ideal temperature. Some heat will come from the UVB lights, but additional heat sources may be necessary. Basking bulbs and heat emitting bulbs can be used for heat. Your pet should not be able to get so close to the bulbs that he could get burned. The cage should have warmer and cooler areas that allow your pet to regulate heat. Your should also have a way to keep track of the cage temperature, like thermometers, in case you need to regulate the heat. You always want to be sure your pet’s home isn’t too hot or too cold. The bottom of the cage will need some sort of substrate, preferably something that makes cleaning up waste easy and is safe for your pet. An easy substrate or bedding can be paper towels or newspaper. You can also use reptile carpet or indoor/outdoor carpet. The carpet should be removable for cleaning. For a more natural look, Eco-earth products are available from pet stores. The Eco-earth looks more like dirt and it is relatively easy to clean by scooping out waste. Your pet will need food and water bowls. The bowls should be heavy or able to be secured to something to prevent spilling. The food bowl should be placed in a high location where an iguana will feel comfortable and safe to eat. Having a couple water bowls is a good idea. Keep one water bowl up high near the food. Place a second water bowl in a lower location that your pet frequents often. Iguanas like hot and humid environments. The water bowls are a source of humidity in your pet’s habitat, but may not be enough. You can add a plastic tub of water to your pet’s cage for additional humidity. You could also mist your iguana and his cage with a spray bottle filled with water. Food and water bowls will need to be cleaned daily with soapy water. Any waste should also be removed daily. Substrate, branches, ledges, and other decor will need to be cleaned or replaced as needed. The smell of your pet’s cage is a good indication of how thorough a cleaning is needed.